How to Redirect the Output Window text to Immediate Window in Visual Studio? How to write a string to the Output Window in Visual Studio? In my previous blog post, I explained how to How to Write a String to the Output Window in Visual Studio? You can also redirect the Output Window text to Immediate Window in Visual Studio when developing a Windows Phone using Visual Studio. The procedure remains the same, the same method Debug.WriteLine () will be used again. 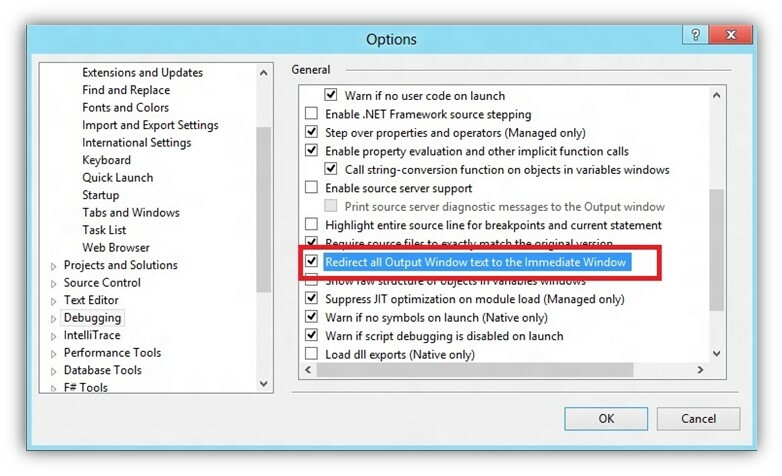 To Redirect the Output Windows text to Immediate Window in Visual Studio, we should enable the “Redirect all out Window text to the Immediate Window” option in the Visual Studio. When running the project, you should see the string in the Immediate Window.